God's Word in the Maori Language. A faithful reprint of the original 1868 translation. Te timatanga o te whakaaro nui ko te wehi ki a Ihowa; he matauranga hoki te mohiotanga ki nga mea tapu. (The fear of the Lord is the beginning of wisdom, and the knowledge of the holy is understanding). Ae, ahakoa haere ahau i te awaawa o te atarangi o te mate, kahore he kino e wehi ai ahau: no te mea kei taku taha koe; ko to rakau ko to tokotoko ko ena hei oranga ngakau moku. He Kupu poke-kore nga kupu a Ihowa: he hiriwa i whakakorea nei te para i roto i te oumu whenua, he mea tuku whitu. For many years the trustworthy and very highly esteemed 1868 translation of the Bible in Maori has been very hard to obtain. However, all of that has now changed! The Trinitarian Bible Society (TBS) of New Zealand, Aotearoa, is extremely pleased to be able to make this faithful Maori translation of God’s Word readily available once again. This proven translation has been highly acclaimed for its idiomatic relevance to the Maori people. 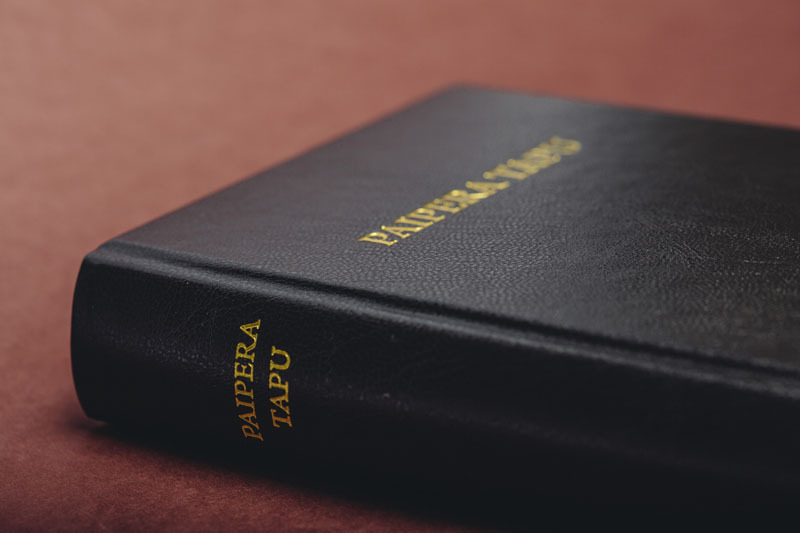 The 1868 edition is an accurate translation in classical Maori, is typeset with macrons, and is faithful to the Divinely-preserved Hebrew and Greek manuscripts that the church of God has always used. Deuteronomy 4:2: “Ye shall not add unto the word which I command you, neither shall ye diminish ought from it.” This 1868 translation contains the entire Word of God, with not a verse missing. This is a high-quality print to last a lifetime. The 1868 translation was itself the culmination of 40 years of labour, beginning in August 1827 when the first Scriptures in Maori came from a press in Sydney. At this time only six chapters, four from the Old Testament and two from the New Testament, were available. In 1835, New Zealand’s first printing press arrived in Paihia, and it was here that a complete edition of the Maori New Testament was eventually printed by William Colenso in 1837. The Maori Word of Life Calendars have been most acceptable to our locals. Very favourably received. 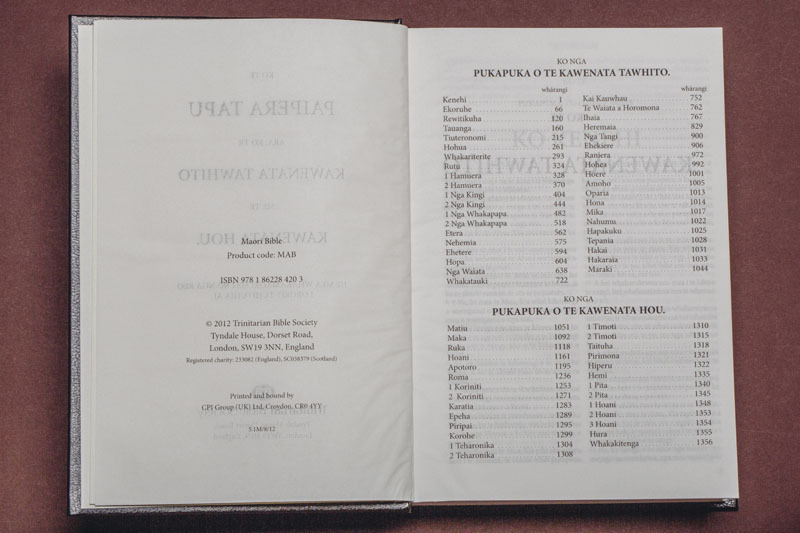 We are very pleased to announce that the Maori Bible 1868 can now be read online in its entirety. It has passed quite a few verification steps, so we are confident it matches the printed edition exactly. But there could still be issued in the printed edition of course. As we strife for 100% accuracy, any reports of printing errors will be gladly received. One of our customers recently send a gift Bible to his nephew in Australia. Here some pictures. Giving away a Bible is a good idea! That the word of God is the only true source of knowledge in Divine things. Let no one despise a small beginning; a match yields but a small flame, but who can extinguish the forest it has lit!